Or so my mom says. 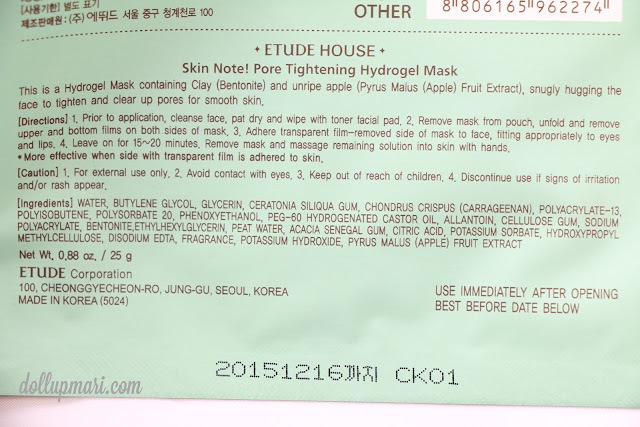 After I applied Etude House's hydrogel mask, my mom was surprized that it was transparent, and that the material was not the usual cloth sheet you see in typical mask sheets. She was also amused that it was really glossy and all, and was super curious about what it is. I couldn't really define hydrogel well, so to describe it to her, I told her it was like applying a thin jelly sheet onto your face, only with a special serum and all. And actually, that's also how I'd describe this mask sheet to all of you. After explaining the whole concept to my mom, she was like 'what a time to be alive!!!' And personally, I also do believe that this is indeed the future of mask sheets. 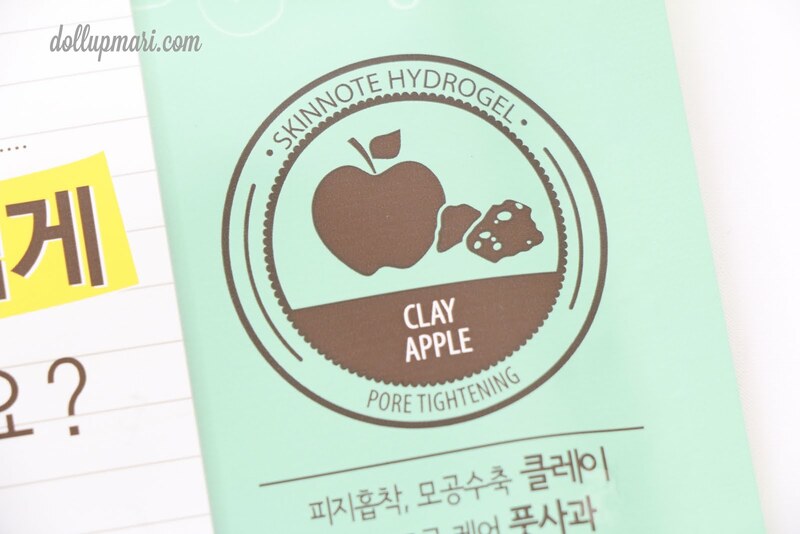 This variant has clay and unripened apple extract, and is meant to be pore tightening. For those concerned, here are the descriptions and the ingredients of the mask. It's definitely not your usual mask once you open it. Instead of a mask sheet, you'll see this. It contains two segments-- one for the uper half of the face (forehead to bottom of nose), and the other for the lower half (mouth to chin). Each hydrogel segment is sandwiched between two cellophane sheets. The hydrogel is sandwiched between an opaque white sheet (which is stiffer, and the one you'll peel off first), and a transparent sheet (it's the smooth covering on top of the textured hydrogel). The first part is to peel off the opaque sheet. You peel the opaque off first because you need the transparent one remaining so that you can visibly position the mask on your face. Don't worry as the opaque sheet gets off really quickly, so you kinda know that it's the one you're supposed to get rid of first. You basically just repeat the process twice, once for the lower and once for the upper half. 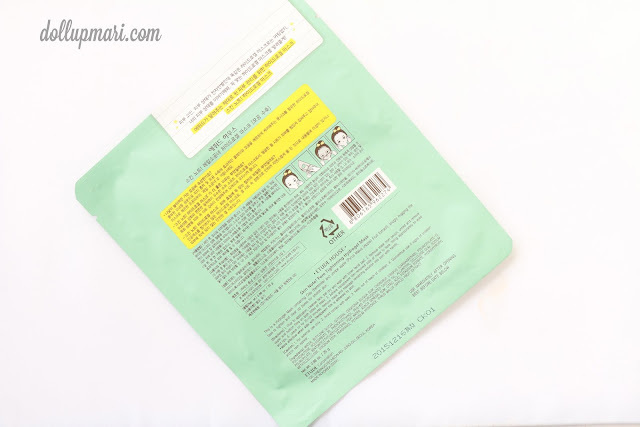 In general, what I like about this is that unlike the usual cloth mask, you do not have to squeeze or wring this, and you can apply it as is without worrying about product dripping off of your face. It's nice as it's low maintenance and there is barely any need for clean up (of drippings on the floor) afterwards. Also, another thing that I noticed is that since this is a jelly-like medium, it can absorb more serum, and it can also transfer more serum onto the skin compared to the usual cloth mask. I like how there's less serum wastage as there's barely any left in the pouch, and that almost everything is transferred onto my skin. While this was on, it smelled like a mild candied apple. I think you can liken the smell to the apple perfumes DKNY has. It doesn't smell like the sweet apple scent you sniff in air fresheners, but you can trace the smell of apples in it. It also had an occasional feeling of tightness and some tingling, and I think this is due to the pore tightening aspect of the mask. The instructions advise users to use this for twenty minutes, but I'm the kind of person who never listens to mask instructions; I think I left this on for an hour without a care. I also usually choose to use masks at night so that I'm not in a rush to go anywhere, and I remove masks on the basis if they're already dry. I think you can see how less glossy and plumped up this is compared to when it was still on my face. You really do get to absorb all the serum. And actually, I didn't throw this mask sheet away and left it on a piece of bond paper to see what happens. To my surprise, the next day, the bond paper got wet-- it only means that this baby holds up a whole lot of serum and moisture. I had glowing skin afterwards, and I think that though my blackheads didn't disappear, it felt as if my pores looked smaller. In general, though, it made my skin nice and dewy. I also like the nice glow I had after using this mask. Personally, I felt that my skin came out better after this mask compared to the other masks I've used. I think it's because my skin was able to absorb more serum in the more or less the same amount of time I have used with my other masks. The only downsides I can note is that for one, the hole for the mouth is too small that often, the mask was on my lips. I had to roll the portion above the mouth upwards, lest the serum will keep on applying itself on my lips. Also, I think that this is best used on a cool night or when there is air conditioning because excessive sweating may cause this to slip. It's glossier than the usual cloth mask so I feel that there's less traction to hold it in once the wearer begins to sweat profusely. Each mask sheet is Php148 and can be purchased at Etude House stores nationwide. 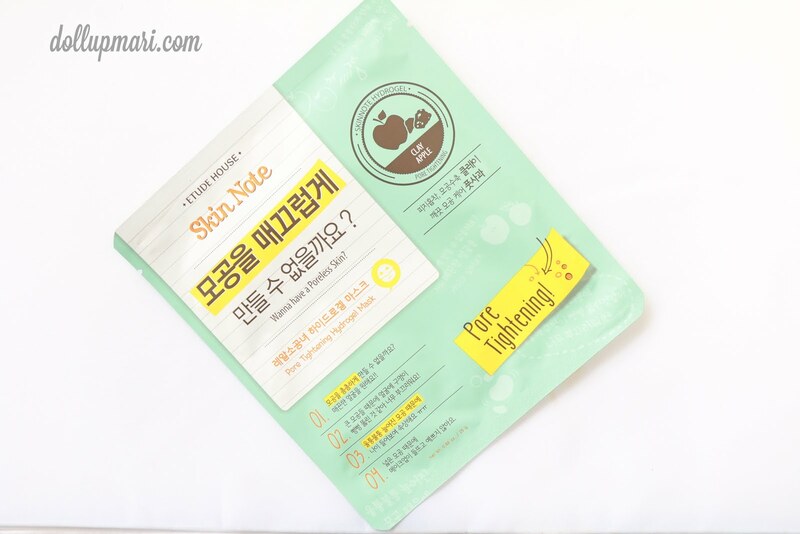 Actually, before I used this, I felt that it was really pricey for a single mask sheet (relative to the usual Php50-70 per cloth mask sheet). It was when I used the mask and saw the new technology in it did I realize that its expensive price is because it comes with a more efficient way to make the skin absorb serum. For the reason that the technology in these masks has afforded me to absorb more serum than the usual, this is definitely a holy grail product. Disclaimer: This product was sent to me by the marketing department of the brand, and in no way is my opinion biased or influenced by this. The post is 100% made of my own thoughts, and I have not copy-pasted from any press release. I was also not paid to blog about this product, I was simply sent samples. Thanks for a wonderful detailed review! Very thorough review! I've been on the fence about these, but I have added a few to my cart. RRS now has them for $1.48 US, which is a great price if you already plan on hauling. Which, of course, is the only way to shop at RRS!